Does British Humor Translate Across the Pond? Do American readers really need a glossary to help define colloquial British words and phrases, particularly ones that signal humor? 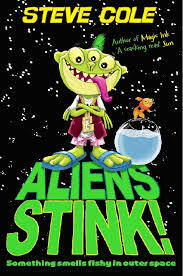 A friend of mine, British children’s book author Steve Cole, recently sent me a copy of his book, Aliens Stink! (still not available in the USA…what’s up with that?) to pass on to an age-appropriate friend of mine, Jack. I read it before I mailed it off (and loved it), but was a little concerned about the Britishisms used throughout the text. For example, within just the first few pages: “binmen,” “wash my bum with tears,” “jumble sales”…the list goes on and on. But Jack had no problems with any of it. And seriously loved the book. I mention this because in a recent article in The Guardian, Louise Rennison, author of the best-selling teen novel Angus, Thongs, and Full Frontal Snogging — which was “turned into a smash hit film that made everyone in the whole world cry with laughter. Apart from Americans” — took a look at the possibility that British humor (or humour) can run into difficulties in the States. Or, at the very least, from American publishers. I’ll tell you who else didn’t laugh: our American friends. The ones from Hamburger-a-go-go land. The Hamburgese. The ones we are supposed to share a language with. Although to be frank any nation that misses the “i” out of “aluminium” are lazy minxes. I mean where would we be if we all just didn’t finish off words? I’ll tell you where: up shi’ cree’ without a padd’. It turned out he had next to no idea what I was talking about in the book. I had to put a glossary of words he didn’t understand in the back for the American editions. Words like “prat” (someone who plays air guitar at concerts or puts two legs down one knicker leg) etc. Common-or-garden comedy words. That everyone knows! Even the Germans. Angus, Thongs and Full-frontal Snogging was called Frontal Knutschen in German. If the Lederhosen folk can make the effort to join in “humour-wise”, why not the Hambergese? So my questions, then, are these: Do American readers, even YA readers, really need a glossary to help define British words and phrases? Are publishers worrying needlessly about a problem that doesn’t exist?